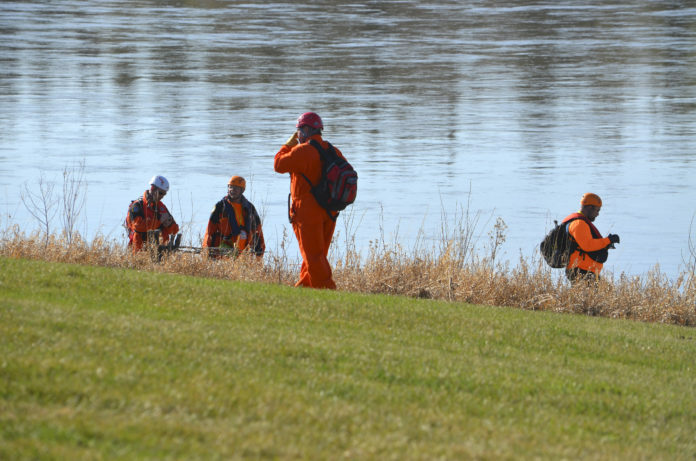 Search and rescue personnel comb the North Saskatchewan Riverbank for signs of Sweetgrass Kennedy in May 2018.— Herald file photo. The disappearance of four-year-old Sweetgrass Kennedy last May spurred hundreds of volunteers to search the streets and riverbanks of Prince Albert, and now it has the City of Prince Albert evaluating how it deals with missing person searches. Kennedy was the subject of what police called an “exhaustive community search” after he was last seen playing with a group of children on the banks of the North Saskatchewan River on May 10, 2018. His body was found 60 km downstream on July 14. Typically, such searches are not a municipal responsibility, but on Monday, Mayor Greg Dionne revealed that the city has been working on an agreement with the Prince Albert Grand Council’s (PAGC) water rescue team to help better coordinate those efforts. The agreement still has to come before council for formal approval, but it’s not the only measure the city is taking. City council also voted to have the Prince Albert Board of Police Commissioners create a draft Emergency Situations Plan, which would provide a framework for volunteer searches, such as the one undertaken to find Sweetgrass Kennedy. The decision was made after a short presentation from Erin Davidson, one of two people who helped organize the more than 300 volunteers who searched for the four-year-old boy shortly after he disappeared. Davidson said they were told to wait for a specialist to arrive, but after several hours passed without the specialist showing up, many volunteers set out on their own, going street-to-street in their search. “If these concerned volunteers had found anything, they would have had no true guidance in dealing with the findings, and could have possibly destroyed, contaminated and ruined any chance of finding the young youth,” she explained. Dionne said there is definitely a need for better communication during those searches, particularly in this instance. He told council volunteers were already organizing volunteer street-to-street search, even though police had already determined that Kennedy had likely fallen in the river. The search for Sweetgrass Kennedy was organized by the provincial government, although the city did call in local emergency operations members to assist where necessary. According to city manager Jim Toye, the province never did give the okay for volunteers to begin a door-to-door search.